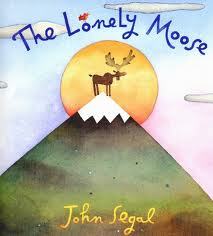 THE LONELY MOOSE by John Segal is the story of a mutually enriching friendship between two very different creatures. Published by Hyperion, this delightful picture book is exactly what our boys would have loved when they were about five. There's a "scary" scene or two, filled with enough tension to make small fingers eagerly turn the page to see what happens next, and the joy-filled ending gives readers the satisfaction of closure that defines all good stories.